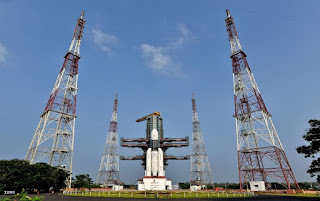 The countdown for the crucial launch of the national space agency ISRO’s heavy-lift rocket GSLV Mark-Three is expected to take off this evening at 05.08 hours from the second launch pad of the Satish Dhawan Space Centre at Sriharikotta in Andhra Pradesh, some 90 kilometres off Chennai. It carries the country’s second high-throughput communication satellite GSAT-29 into its planned geostationary transfer orbit. The satellite will increase hi-speed communication facilities in the north east and far flung areas of the nation. This is the second test flight for the rocket GSLV Mark-III. Its success today would prove its reliability for commercial launches. The middle stage uses liquid fuel and the upper one is a cryogenic engine. The multi-beam and high-throughput communication satellite GSAT-29 will carry Ku and Ka band transponders. It also has a few other systems, for experimenting with the evolving technologies in satellite science. The mission life of the satellite is over ten years.